HomePress ReleaseiZettle Review 2019 – Is Still the UK’s Best PDQ Machine? iZettle is an award-winning payment processing company and one of the most common options for small businesses in the UK. Its mobile card reader means you can accept payments almost anywhere and offers a variety of small-business solutions including point of sale terminals, and merchant accounts. As the first company to develop a chip-payment terminal and smartphone payment-processing app, iZettle is one of the best and oldest providers of small-business card payment solutions. iZettle hit the market in 2010 and now provides solutions to many small businesses throughout the UK. However, with many competitors including household names such as Worldpay, Stripe, and PayPal, iZettle is far from your only choice for a mobile card processor for small business. iZettle offers its clients flexibility with two types of services: Pro and Go. Go is a free service with a fixed 1.75% fee on all dealings, making it an excellent choice for startups that want to start taking payments without hassles or costs. Pro is intended for everyday businesses like restaurants, cafes, and bars, and is like Go but with additional features. Subscribers to both plans can take and manage payments using iZettle’s card reader. You’ll need to shell out £59 to get the PDQ machine. The card machine does not print receipts. So, unless you can email receipts to your clients, you will have to purchase a receipt printer separately. One of the main benefits of iZettle’s product is that there’re no monthly costs. And while lots of card processing companies ask for a fixed fee for every transaction, iZettle only charges 1.75 percent on every transaction. However, if your earnings are over £8,000 monthly, you can try negotiating a custom price plan. The iZettle tablet and smartphone app are how you manage charges that are sent to the iZettle terminal and check your transaction history. The free app is obtainable from the Apple App Store for iOS devices and the Google Play store for Android devices. Note that the app is required to use the iZettle card reader, and vice versa the card machine is required to use the app payment processing. To get started with the iZettle app, all you’ve to do is install it on your machine and create a business account. Once that’s done, your business is ready to start accepting payments through iZettle. iZettle provides a vast collection of supported hardware, as well as barcode scanners, cash drawers, and receipt scanners that can be incorporated to improve its offerings. All products are obtainable through iZettle’s store, so you know what you buy can be easily synchronized with the solution. Easily connected to the iZettle’s system using Bluetooth technology, the extra pieces of hardware are an excellent way to save customer time and your time by keeping cash on hand, scanning items, and instantly printing receipts. iZettle has made a dock with an in-built battery charger; enabling you to charge the iZettle card machine while the device is placed on the counter. This means that you don’t have to fret about tangled cords and you’ll always have the terminal at a full charge when you need to make sales. When you count on a machine to accept payments, you need to know that support is there should you need it. With iZettle, all clients have access to ticket-based email support and phone support during office hours (9 am to 5 pm). iZettle is well known for its security features. This device is foolproof, and will even auto destruct if you try to mess with it. The payment terminal encrypts all debit and credit card data to the highest degree. 1. What types of accounts does iZettle provide? They provide both private and business accounts. 2. Who are the typical users of iZettle? 3. What languages does iZettle support? 4. Does iZettle support mobile devices? 5. Does iZettle offer an API? No, iZettle doesn’t have an API. 6. What level of support does iZettle offer? iZettle offers the following support options: Phone Support, Online support, Knowledgebase, and FAQs. 7. Does iZsettle work without an Internet connection? No, they currently don’t offer an offline mode because of card security issues. 8. Are there iZettle voucher and discount codes? Yes, the site does offer some if you look around. 9. Can I take out business loans and cash advances with iZettle? Yes, over time if you’ve built up a solid relationship with iZettle. In terms of mobile payment terminals, iZettle currently offers the best device on the market. 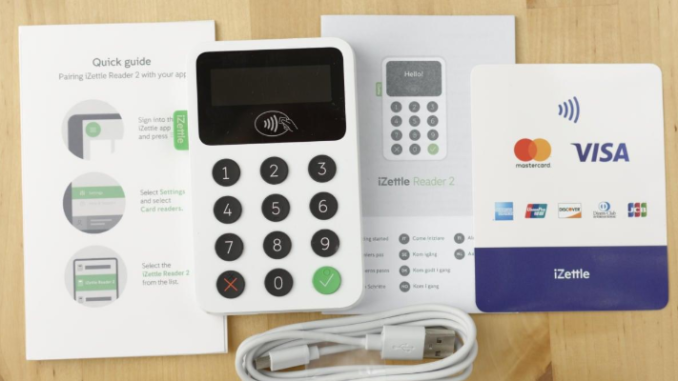 iZettle Reader is a handy device for SMEs. Its compact reader crams everything you need to receive card payments into a mobile device that you can take anywhere. Getting the iZettle system is a minimal investment, as only the purchase of the card machine is needed. You can download the app for free and with no obligations or monthly fees. SMEs are safe in knowing that they only have to pay if they make sales. Also, the transaction fee is quite low in general, and the volume discount reduces the cost per transaction significantly. Both setting up and using iZettle is incredibly easy. Accepting sales only takes seconds and inputting the products is fairly simple. The detailed reporting function and dealings history helps businesses understand their peak sales situations. With a highly responsive customer support team, iZettle provides SMEs with the confidence that they can use the iZettle system to take payments without any major issues.